eyeson is a cloud-based communication app for video and web conferencing that supports YouTube and Facebook live streaming, multiple integrations and unlimited participants. With eyeson, users can start spontaneous video meetings directly from their slack channel or use a trello power-up to have eyeson video meetings directly on their trello boards. Users can invite guests into their meetings with a simple 'click to join' weblink. For marketing and sales teams, eyeson provides features for webinar live streaming on facebook and youtube. With the premium version, users can collect contacts from their meetings and webinars to create qualified leads. eyeson allows users to add a simple video meeting button to their freshdesk, zendesk or talkdesk platform, then start a video meeting right from within a ticket. With recording technology, users can selectively create a video file of the issue and have a history video link for reviewing it directly on the ticket. Fast video conferencing.It's just one click and you are ready to roll. That's really convenient! Skype takes minutes to start, update, initialise, find the right contact with his right profile,... It is not possible to start spontaneous Google Hangouts sessions... eyeson is nowadays really the tool I choose to use for video conferencing! It's just one click and you are ready to roll. That's really convenient! Skype takes minutes to start, update, initialise, find the right contact with his right profile,... It is not possible to start spontaneous Google Hangouts sessions... eyeson is nowadays really the tool I choose to use for video conferencing! Think does guys are doing a great job. The more people use the software the more easy it will be to get people hop onto a call without having to tell them what eyeson is. have used it since the start. It's the best video collaboration tool I have seen so far! Awesome HD video conferencing solution, runs pretty much everywhere & unifies a lot of tools for us! Higher productivity, unified our video conferencing, online meetings and workshops via eyesonAlso works with Slack and Dropbox, which is really important for me as I do most work in collaborations with other co-workers. Also works with Slack and Dropbox, which is really important for me as I do most work in collaborations with other co-workers. I gave only four stars for costumer support, but actually I didn't need it so far. So on that is good news, but at the same time I can't give a qualified answer on that. Great! A state-of-the-art conferencing tool. saves time Intuitive and userfriendly. Great quality. To be used with any device (mobile or PC). No SW installation needed, comes along with a lot of extras, like chat etc. Intuitive and userfriendly. Great quality. To be used with any device (mobile or PC). No SW installation needed, comes along with a lot of extras, like chat etc. Not so many cons from my side. I believe that this tool is going to find its way into many companies worldwide, hope it will set a new standard in communication. Free: Always $0/month for 2 eyeson rooms. Premium: Starting at $4/month with unlimited room sessions. Supports multiple integrations with popular applications including Slack, Dropbox and Zendesk as well as Freshdesk, Hipchat and Trello. Users can invite guests to a meeting in one click, via a 'click to join' weblink. eyeson is mobile-optimized for up to 9 people in a video meeting. eyeson supports webinar live streaming to YouTube and Facebook. eyeson Oofers High Definition (HD) video quality. Below are some frequently asked questions for eyeson. Q. What type of pricing plans does eyeson offer? Q. 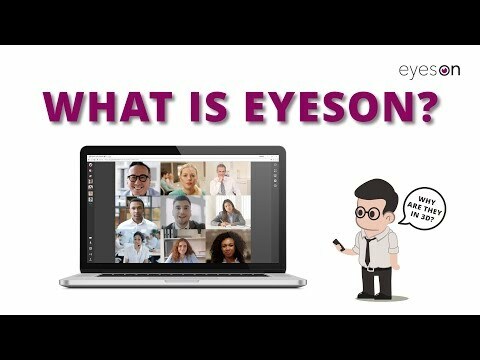 Who are the typical users of eyeson? Q. What languages does eyeson support? Q. Does eyeson support mobile devices? Q. Does eyeson offer an API? Yes, eyeson has an API available for use. Q. What other apps does eyeson integrate with? Q. What level of support does eyeson offer?